The articles published in Journal of Animal Research and Nutrition have been cited 15 times by eminent researchers all around the world. 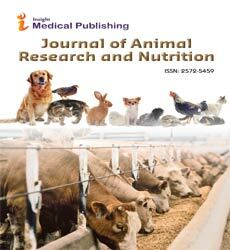 Following is the list of articles that have cited the articles published in Journal of Animal Research and Nutrition. Hessenberger S, Schatzmayr G, Teichmann K (2016) In vitro inhibition of Eimeria tenella sporozoite invasion into host cells by probiotics. Veterinary Parasitology. 229:93-98. Kartheek RM, David M (2016) Fipronil induced modulations in biochemical and histopathological aspects of male Wistar albino rats: A subchronic study. World 5: 26-32. Surai PF, Fisinin VI. L22 Natural antioxidants and stresses in poultry production: from vitamins to vitagenes. Al-Ruba SH. Serum antioxidant status in Iraqi women with endometrial cancer. Nardoia M. Effect of dietary polyphenol-rich grape by-products on growth performance, some physiological parameters, meat and meat products quality in chickens. Safdari-Rostamabad M, Hosseini-Vashan SJ, Perai AH, Sarir H (2016) Nanoselenium Supplementation of Heat-Stressed Broilers: Effects on Performance, Carcass Characteristics, Blood Metabolites, Immune Response, Antioxidant Status, and Jejunal Morphology. Biological Trace Element Research.22: 1-2. Khan MT, Mahmud A, Zahoor I, Javed K. (2016) Organic and inorganic selenium in Aseel chicken diets: Effect on hatching traits. Poultry Science. pew403. Przywitowski M, Mikulski D, Zdunczyk Z, Rogiewicz A, Jankowski J. (2016) The effect of dietary high-tannin and low-tannin faba bean (Vicia faba L.) on the growth performance, carcass traits and breast meat characteristics of finisher turkeys. Animal Feed Science and Technology. 221: 124-36. Gopalakrishnan L, Doriya K, Kumar DS. Moringa oleifera (2016) A review on nutritive importance and its medicinal application. Food Science and Human Wellness 5: 49-56. Iwuji TC, Obiejezie NR, Ogbuewu IP, Etuk IF, Ahiwe EU,et al. (2016) Reproductive and Haemato-Biochemical influence of aqueous extracts of Moringa oleifera leaves on adult New Zealand Rabbit Bucks. International Journal of Life Sciences and Technology 9: 74. Velázquez-Zavala M, Peón-Escalante IE, Zepeda-Bautista R, Jiménez-Arellanes MA. Moringa (Moringa oleifera Lam.) (2016) potential uses in agriculture, industry and medicine. REVISTA CHAPINGO SERIE HORTICULTURA 22: 95-116. Liu X, Wu C. The Proceedings of XXV Worlds Poultry Congress 2016 Invited Lecture Papers. Surai PF, Fisinin VI (2016) Vitagenes in poultry production Part 1, Technological and environmental stresses. Worlds Poultry Science Journal 72: 721-734. Surai PF, Fisinin VI (2016) Vitagenes in poultry production Part 2. Nutritional and internal stresses. Worlds Poultry Science Journal. 2016 72: 761-772. Surai PF, Fisinin VI (2016) Vitagenes in poultry production: Part 3. Vitagene concept development. Worlds Poultry Science Journal 72:793-804.